Another Beautiful Day in Paradise. We had beautiful clear blue skies with a little breeze out of the SE. Temperatures were in the high 60s. 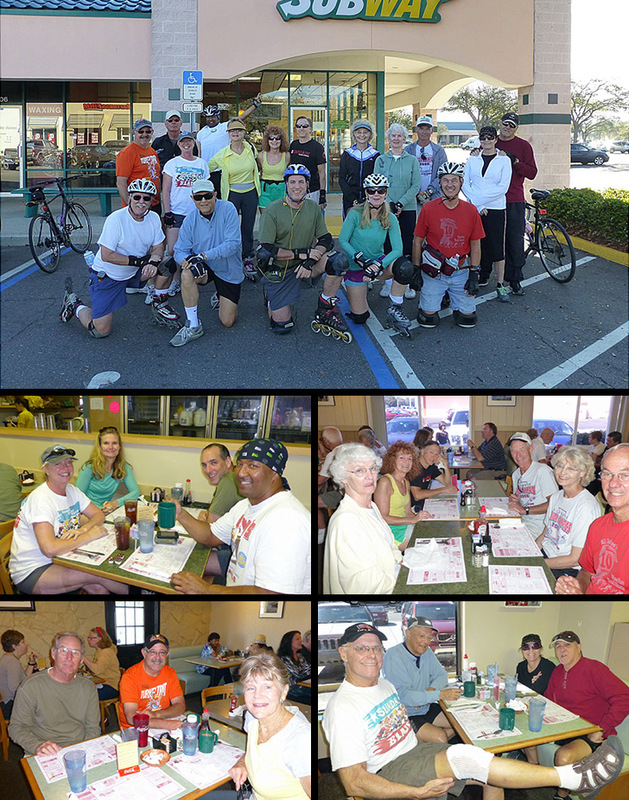 Bladers/bicyclers Rob H, Roy H, Laura P, Rick the Breeze, Glennis W, Sandy & Glenn R, Diane S, Carol J, Bill S, Ginnie S, Rick P, Dee T, Steve G, Joel & Kim F and Jeff B came. Welcome all. Two groups did the basic Walmart route to 34th St and back. One group did 11.5 miles and the other 13 miles. We had 7 Bladers and 10 Bicyclers. Glennis W, Leo F and Ken M renewed their Sponsorships since the last reporting. Thanks for the website support. We Brunched at Doe Does as planned. Doe Does was pretty busy but we got in within about 10 minutes. The service was good, the coffee flowed freely and the food great as usual. Dee's table gave Doe Does a 9.5. Oh yes and Bruce showed up for Brunch to show all his bandaged up knee.